According to a 2014 survey, South Africans are currently paying approximately 76% of their income on debt. This indicates that South Africa has a debt, as well as a debtors problem. In this financial climate, businesses, small and large alike, cannot afford to let their debtors’ books spiral out of control. Swift handover of outstanding amounts to an Attorney, is the most effective manner in which to ensure that a maximum of overdue accounts are collected. To ensure that debt is recovered as efficiently and quickly as possible, it is imperative that a coherent mix of soft and hard collections be followed. You therefore need to ensure that a strategy is put in place to minimise bad debt, and improve your cashflow. At Vermeulen Attorneys we have put processes in place to enable us to take care of both your Soft and Hard Collections. This ensures that no time is wasted in handover from Collection Agents to Attorneys. We have further structured our processes to ensure a maximum file turnaround in minimum time. Applications to Declare Immovable Property Executable. How big must the amount be if I want to hand it over for collections? Whether your contract makes sufficient provision for legal costs to be recovered from the debtor. When is a debt too old to collect on? If the debt is older than 3 years then it may have prescribed. Prescription means that the debt has been extinguished because too much time has passed. There are exceptions to the rule. When in doubt, speak to an attorney. What if it’s a delicate matter and someone I know? Soft collections are ideal in this situation as we have a friendlier approach. Any and all collections can be handled as per your request, if you need us to be friendlier, we can do a friendly letter instead of a letter of demand. A verbal contract is just as valid as a written contract. If you and your debtor reached a verbal agreement, it is binding and capable of collection. What if the debtor disputes their outstanding balance? Dispute resolution goes hand in hand with debt collection. We are equiped to find out what the dispute is and to act accordingly. If no agreement can be reached we proceed with litigation. I cannot get hold of the person owing me money; what now? Our offices have an in-house tracing department to assist with preliminary debtors’ tracing. 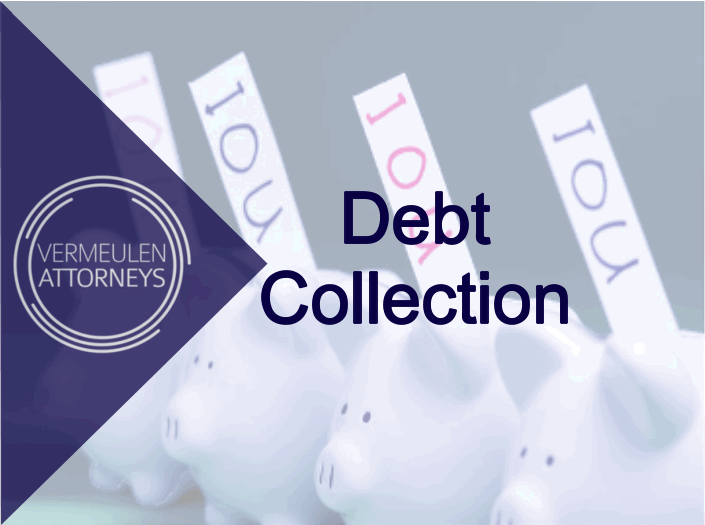 Once the debtor has been located, we proceed with the collections process.